For encoder based systems, defines the number of encoder steps to accellerate from velocity minvel to velocity vel. For stepper motor systems, defines the number of steps to accelerate from minvel to vel. For various operations and in order to eliminate unnecessary move commands, prior to and after finishing an operation, the tool will raise clearance distance. As this new variable is implemented, commands that use it will be referenced below. For encoder based systems, defines the number of encoder steps to decelerate from velocity vel down to velocity minvel. For stepper motor systems, defines the number of pulses to decelerate from velocity vel downto velocity vel. Defines the depth per pass in boring and facing operations, unless overridden by supplying a dinc value. purpose: Used to drill holes at a given coordinate with an optional plunge to prevent binding of the drill. For a regular hole, this command moves to location x,y,z1,z2 and drills to depth d1 in plunge increments if specified. If xoffset,xcount,yoffset,ycount are defined, this command drills an array of holes starting at x,y,z1,z2 and drills an array of holes in one neat little command. description: Axis can be x,y,z,a,c in a positive or negative direction. For c, the edge finder is used to find the center of a hole, and offsets are irrelevent. Moves right until an edge is found. Proximity X location 18.99 19.277 19.1335 Not important to calculations above. For a given operation face will operaton a rectangle either by the supplied xystep or a default value, shifting its vertical position in dinc steps at a time until reaching d1 and d2 for each z axis. purpose: To face from point1 to point 2 at a given depth in dinc increments. This is usually used as a followup to the face command to clean up edges, but can be used for many other functions. 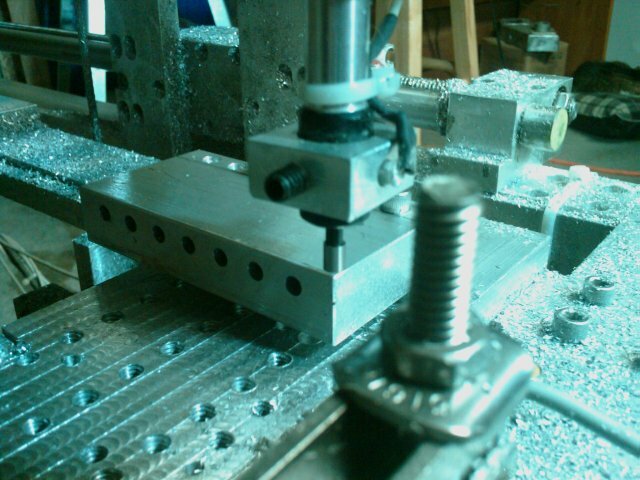 For example, milling to a given depth with a ball nose endmill could produce a channel. Unlike the face command, facep1p2 does not have to be rigidly defined by X or Y. However, the z coordinates should be equal unless a ball nose endmill is used simply because of the chatter that would occur, but this too is not required. Seeks first to Z home switches, and then to X and y concurrently. While it's possible to home all 4 axis at once, this is unsafe on some occasions. Displays message to operator, and if any key other than esc is pressed, continues. If esc is pressed, the program is aborted. purpose: To drill holes along an arc description: This command is used to drill holes around a radius point in given increments of degrees (astep), starting at sangle and continuing until count holes are drilled. If Plunge is not defined, plunge depth is equal to depth. description: Starting at x,y,z,z2, A radius of boring holes is defined. Starting at startangle, and proceeding for count locations, hole is bored to a given depth and radius. description: Starting at x,y,z,z2, A radius of boring grooves is defined. Starting at startangle, and proceeding for count locations, a slot is faced to a given depth from the inner radius point (r1) to an outer radius point (r2). If a2 is specified, this facing operation is rotated about r2. Unlike most radial operations, r2 can be less than r1 and are merely used to define starting points in the facing operations. description: defines positional stepover for radial motion. Each increment in a radial operation calculates its move as a step of 0.005" increments. Usually, this value is closer to 0.001 or lower for a proper finish. This value should be greater than the value in any direction a step takes, or an encoder takes for Servo based systems. command: text x,y,z,a "Text to scribe"
text 1.25,1,15,0.5 "OsiruSoft Research and Engineering"
For each tool definition, a radius and depth offset is assigned. edge x+ 0.1 ;assigns tool 0 and finds edge. As with the homing sequence, tool change involves first moving from the current location to tool change Z. Afterwards, x and y are moved to tool change. Because this position is used for milling orthotics, this position is in millimeters. For a given program, the vel command can be issued to determine velocity. Also, in the terminal, pgup and pgdn keys can be used to increase and decrease velocity. The stepper motor controls should never exceed 22 IPM and should be lower for higher torque operations, whereas the servo based system should never exceed 150 IPM. This value is usually a little bit less than the diameter of the tool being used. P Proximity test Finds the end of the tool, using a proximity sensor.